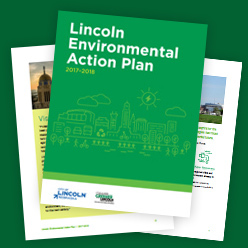 Mayor Chris Beutler has released the final Lincoln Environmental Action Plan (LEAP) to guide City action in the areas of energy, land use, transportation, waste and water. The LEAP was introduced at the City Council meeting Monday, December 11 and includes changes suggested by the community since the draft plan was released in July. The Council will have a public hearing and vote on the LEAP Monday, December 18. The final plan is available here. More aggressive goals to reduce solid waste going into the City landfill. The implementation of energy savings performance contracts, a tool to improve the energy efficiency of City streets lights and public buildings and save taxpayer dollars. The development of a prairie corridor to preserve our landmark landscapes and promote eco-tourism. The testing of new autonomous vehicle technology to improve travel times, increase safety and reduce fuel costs. If you are a resident of Lincoln, contact your City Council member before December 18th here. This entry was posted in Community Partners, Nebraska / Midwest News and tagged City of Lincoln Mayor's Office, Cleaner Greener Lincoln, Cleaner Greener Lincoln Director Frank Uhlarik, Lincoln City Council, Lincoln Environmental Action Plan (LEAP), Mayor Chris Beutler, Resolution 17r296 on December 14, 2017 by Helen Deffenbacher.